In 1961, Indonesian President Sukarno prohibited rock and roll and other western genres of music, and challenged Indonesian musicians to revive the indigenous arts. Gugum Gumbira took up the challenge, and studied rural dance and festival music for twelve years. Jaipongan, or Jaipong, was the most popular result of his study, derived from the updating of a village ritual music called ketuk tilu, with moves from Pencak Silat, the Indonesian martial art, and music from the masked theater dance, Topeng Banjet, and the Wayang Golek puppet theater. In the original ketuk tilu, the group typically consists of the ketuk tilu pot-gong, other small gongs, a rebab (spike fiddle), barrel drums, and a female singer-dancer (ronggeng) who is often also a prostitute, who invites men to dance with her sensually. Gugum expanded the drum section as part of an urban gamelan orchestra, sped up the music, redefined the singer as just a singer (sinden), and came up with the catchy onomatopoeic name. Many listeners consider the music very complex, with the dynamic rhythm liable to change seemingly randomly. Jaipongan debuted in 1974 when Pak Gugum and his gamelan and dancers first performed in public. Sporadic government attempts to suppress it due to its perceived immorality (it inherited s ome of the sensuality of ketuk tilu) just made it more popular. It survived even after the official Indonesian ban on foreign pop music was lifted after a few years, and became a craze in the 1980s. 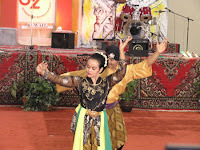 Since the mid-1980s Jaipongan’s importance as a social dance has waned, but it remained popular as a stage dance, performed by women, mixed couples or as a solo. The most widely available album of Jaipongan outside Indonesia is "Tonggeret", featuring singer Idjah Hadidjah and Gugum Gumbira's Jugala orchestra, released in 1987, and re-released as part of "WestJava: Sundanese Jaipong and other Popular Music", by Nonesuch Records under their Explorer Series label.